On my quest searching for information on the pistachio cream used in Montebello, I came across this beautiful picture of a pear, filled with cream. AMAZING!!! I had extra pistachio cream from my Montebello Torte, and I happened to have red anjou pears in my fridge. That is the best coincidence ever because I rarely rarely buy anjou pears. Actually I rarely buy non Asian pears and HATE Packham pears, the most common ones available here. The only time I ate the most pears, non Asian ones to be exact was when I was pregs with Lydia. I became a fruitarian for 7 weeks. The mouth won't accept anything besides fruit. I won't want to bite, nor want to chew or swallow anything else but fruit. I suffered from bad constipation due to hormonal changes and it's my body's way of helping me by turning fruitarian. But still the constipation was still bad. Disgusted? Don't be. It's common during pregnancies and I'm not the only one. I didn't choose to constipate nor did I choose to turn fruitarian, my body.. it's my body. Why did I eat so much pears? Well, basically I had a lot lot of fruit. One dinner will consist of 5 servings of fruits, at least. If not, how can I be full? One day I eat a lot lot of fruits. And my doctor told me papaya, watermelon, pineapple and grapes are No-No for the first trimester. 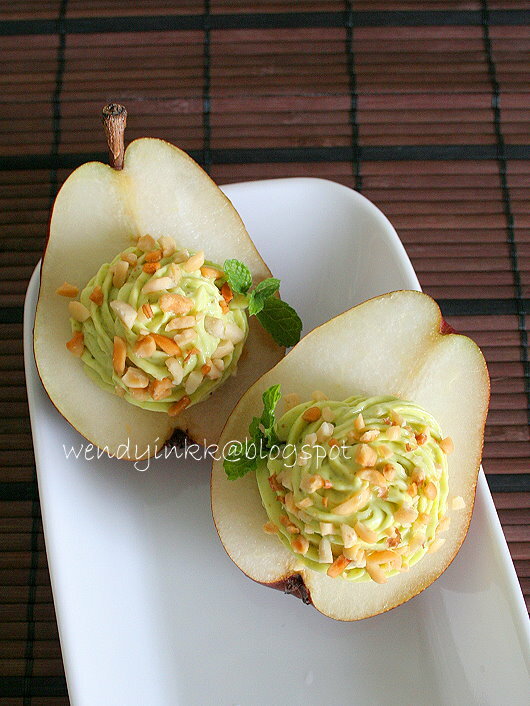 And apples and pears are the most filling ones.. besides banana of course and I'm not supposed to eat so much durian. And it was just around this time..... when pears and apples of all sorts are abundant. My husband wasn't around and I went through my first 6 months of pregnancy, pretty much alone. I dropped 7 kg during this 7 weeks. When I was 14 weeks, suddenly I wanted to eat Sweet Sour Pork rice for dinner, and from then onwards, my appetite went back almost normal. Yeah, almost because I still can't take roasted pork and brown rice, and weirdly KFC. And few weeks back, I was reminded of Devilled eggs, saw on Feats of Feasts. So, let's call these pears, devilled pears... they do look like eggs, right? hahaha! This dessert is to be eaten with fork and knives..... not a spoon. 4 mint leaves, finely snipped. 1. Mix lemon juice with mint leaves. 2. 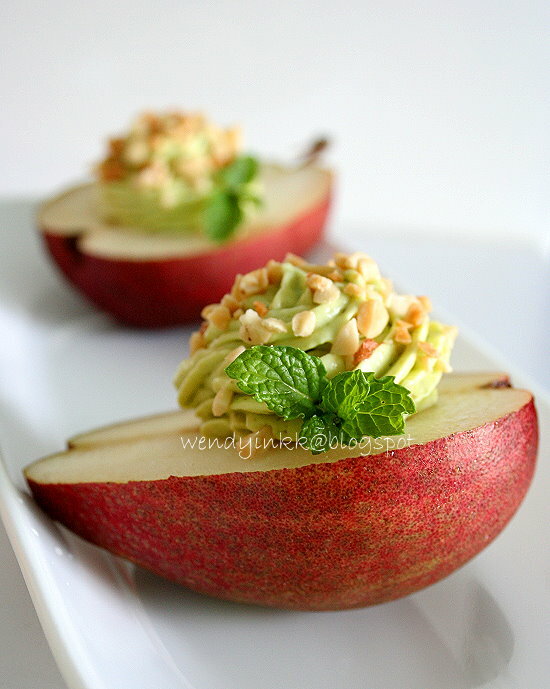 Half pears and remove the core with a melon baller. 3. 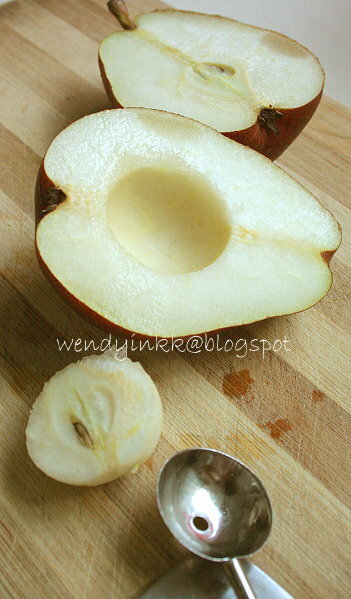 Thinly apply the minted lemon juice to the cut surface to prevent the pears from browning. 1. Mill pistachio with sugar and cornstarch to get a finer texture. 2. Prepare pistachio pastry cream. Mix yolks with cream, and on low heat until it turns slightly warm, put in powdered pistachios and cook until it begins to thickens. (if using heavy based pot, stop when it starts to thicken. If regular stainless steel pots, cook until it thickens. When you stir, the whisk leaves trails that you can see the base of the pot). Put into a bowl, let it cool down, cover with cling wrap and chill. 3. Put ceramic/glass mixing bowl into freezer. (If using stainless steel, skip this and place bowl in a ice water bath only. 4. Place water in a small heat proof bowl. Sprinkle gelatin over and let it sit for 1 minute. Melt it either over hot water bath or in the microwave. Let the mixture cool down, it won’t take long. 5. Remove mixing bowl from freezer and put in whipping cream. Beat until streaks start to show and put in sugar and beat until soft peaks. Put in gelatin mixture and beat until stiff. 6. Remove cold pistachio pastry cream from fridge. 7. Put a few Tbsp of the whipped cream into the pastry cream, fold to lighten it. Repeat with a few more Tbsp of whipped cream. 8. Pour the pastry cream into the whipped cream and fold until incorporated. The combination of red-skin pear and green pistachio cream colors is very much a Christmas-y feel. 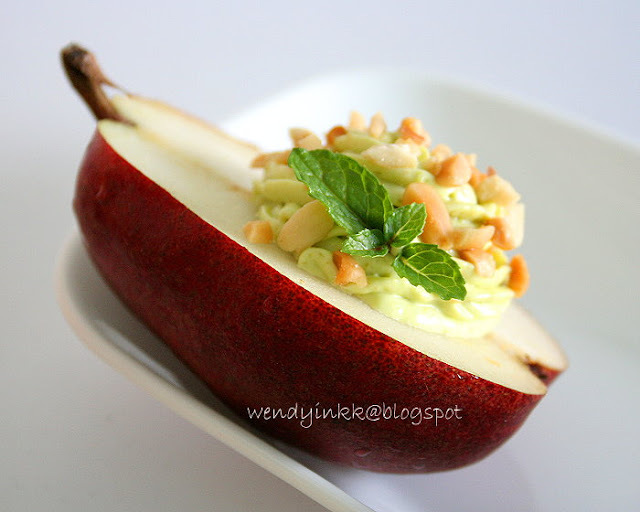 very special pear with cream, i have never use pear in cooking, just eat it straight away, hehehe..
i'm actually drooling over the pistachio cream and the nuts filling!! but it looks very appealing sitting on the pear! What a brilliant idea! pistachio n pear.....im sure it'll taste really nice. Beautiful! 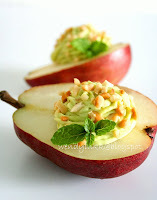 I love the color contrast of the pears and the pistachio cream! Must be really delicious! what a beautiful pear! 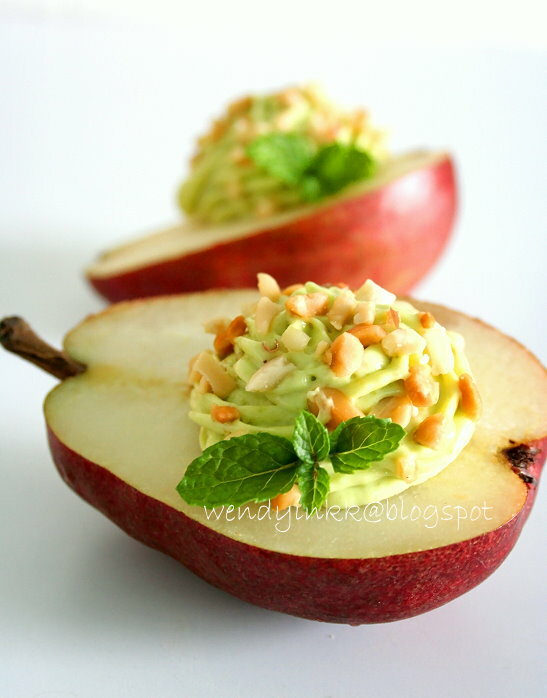 such a great idea to devil pears instead of your usual eggs! I may keep this in mind for other fruits! wah, now i'm starting to fantasize all the different types of fruits I can do this to! Oh, boy! This looks so good. I have a big tub of Pistachio cream and I have been looking for recipes to use it up. This is perfect! Hahaha, oh yes, we had these for 2 afternoons straight, perfect tea time snacks! Actually I also wanted to submit these to Swee San's event, but tarik diri from submitting too much, hahaha! I am just a home maker that loves to cook and bake. I learn a lot from surfing... a lot. I get inspiration looking at other's recipes or from personal experience. I'm a restaurant's worse fear, I always try to figure out their dishes, hahaha! oh no, this is not cooked. Almost eaten straightaway too, that is after filling with the cream. If Malaysia has this, I'm sure Singapore has it. Sometimes even Barlett comes in red. oh no.. I didn't come up with this. I was inspired by Rawmazing. I love Asian pears, except duck pears. either queen or witch, hahahah! they must eat whatever I cook for them. I love going to Tesco for more special fruits, Tesco is more daring to bring in new varieties. These are beautiful!! And what an awesome idea, I've never seen anything like this before, but it sounds delicious. I will have to try this(or something like this) for sure!